Ever click on something and you just get so addicted you can’t stop? That kinda happened to me the other day, and I’m still clicking this thing! So check it out, this is the Spinning Wheel of Prizes which our friends at iGiveaAwayprizes.com were nice enough to send over for our review. I’m definitely a sucker for sweepstakes, but this seems to be something more. For starters, its more of a game, so you are spinning and spinning until you find something that you like. At that point you can choose to engage with that sweepstakes, prize, coupon, deal, savings or whatever you landed on. Some of my favorite prizes were things I just didn’t expect to be interested in. For example, I landed on an offer which unlocked hundreds of coupons that were not available to me previously. I know, I know, its easy to find coupons and sometimes I get tricked anyway and click on something that seems unique and ends up being that same exact coupons.com coupon gallery which you see on pretty much every website. But this was cool, I’m serious, I walked away with a 25% off coupon for sneakers at FamousFootwear which I have never seen on other sites before. Maybe I just got lucky? Since I’m addicted to this game as I mentioned above, I of course went ahead with a 2nd spin. Whats cool about this game in comparison to others is that you get somewhat of a choice. If you spin, and don’t like the reward, then you can spin again. Just to be clear, these are rewards, sweepstakes, and giveaways, so it just depends what you’re into. After spinning the wheel, click on the offer and go to the thirdparty sweepstakes site where your info should be prepopulated into that form already, simply add any additional information that’s requested and hit submit to enter that offer. 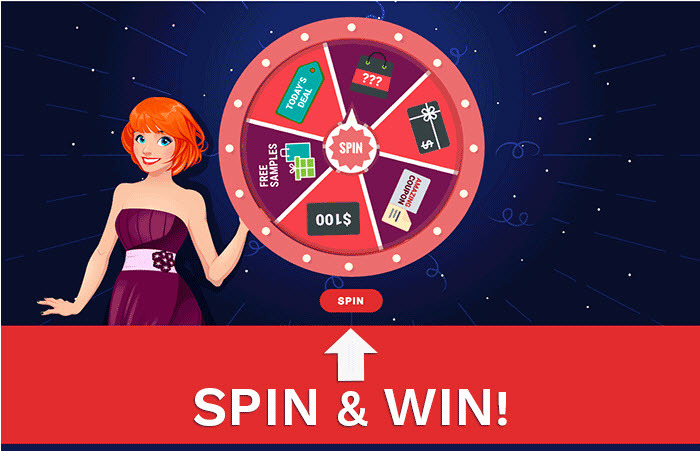 I noticed two unique aspects of this sweepstakes 1) After your first spin you are given a simple cash sweepstakes entry form which you can fill out without leaving the site…this is very useful to quickly enter a sweepstakes before clicking off to another sweepstakes. 2) The next day you will get an email unlocking 5 more spins! You simply click on that link and it takes you back to the wheel for more sweepstakes! Previous Offer: The art of Shaving… reinvented!